Audi Certified. EPA 28 MPG Hwy/20 MPG City! Sport Premium trim. Heated Leather Seats, Moonroof, Panoramic Roof, Power Liftgate, BLACK HOMELINK, Aluminum Wheels, Turbo Charged Engine. SEE MORE! 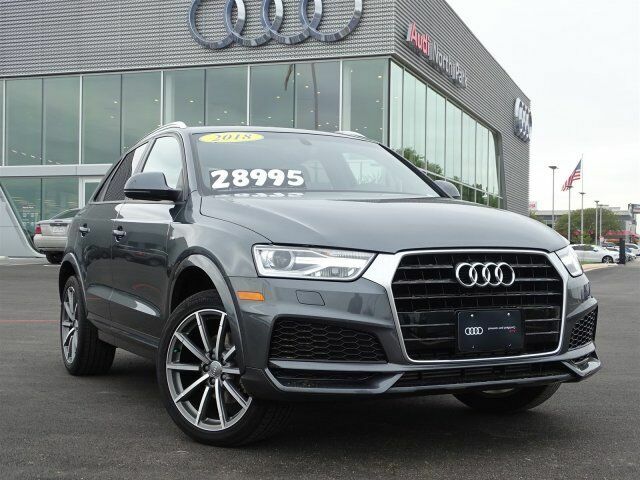 Leather Seats, Panoramic Roof, Power Liftgate Audi Sport Premium with Daytona Gray pearl effect exterior and Rock Gray interior features a 4 Cylinder Engine with 200 HP at 5100 RPM*. BLACK HOMELINK. Rear Spoiler, MP3 Player, Sunroof, Aluminum Wheels, Privacy Glass, Keyless Entry, Remote Trunk Release. KBB.com's review says "It's fun to drive with a desirable balance of comfort and performance. The Audi Q3 feels equally at home cruising down the highway as it does taming a winding canyon road. ".